Fares on trains serving the Sleaford area are set to rise by 1.5 per cent in the new year, it has been announced today (Friday). Fares on East Midlands Trains will rise by on average by 1.5 per cent (23p per average single journey) from January 2 as part of announcements on train fare increases across the country today. This is below the July inflation of 1.9 per cent which is used by the Government to set all regulated fares, including season tickets, and is also below the national average increase for 2017. This means that East Midlands Trains customers will see fares on average reducing in real terms. Jake Kelly, Managing Director of East Midlands Trains, said: “We have worked hard to offer the best value travel for our customers. 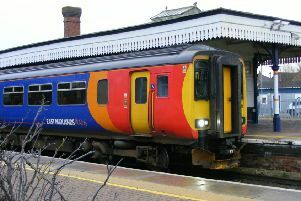 The changes in January will mean fares for East Midlands Trains customers will on average reduce in real terms. As well as paying for the running of the day-to-day rail network, fares are said to be helping government to support investment. East Midlands Trains is currently investing £13million in improvements for customers. Recent improvements include roll out of free 15 minutes WiFi across all London train services; improved compensation systems with fast access to compensation for delays of over 30 minutes; better passenger assistance with the booking time reduced by half; millions of pounds invested in station improvements with more cycle spaces, better car parking, easier access to tickets and improved information; investment in training and recruitment to ensure that customers get the best service possible; extra cleaning staff at stations and on trains. For more about your rail fare go to www.nationalrail.co.uk/times_fares/ticket_types/83871.aspx.